News listed in date order . 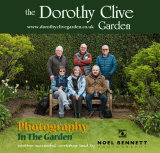 . .
First workshop held at Dorothy Clive Garden. A great day had by all yesterday. Starting off with my Top 10 Tips, then onto some technical stuff and finally off into the 12 acre garden . . .
A small select gaggle of enthusiastic garden photographers enjoyed a chilly but sunny day perfecting their image composition, along with a little exposure compensation - Whoopy-doo!! A new chapter in Litchfield . 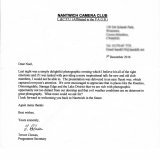 . .
Just received from Nantwich Camera Club this morning. It hasn't happened before, but I've won Three Counties Open again. New works into Denstone Hall Farm Shop. Called in to see Emma at Denstone Hall Farm Shop • Café. so I guess Emma was happy to see her Café walls laid out with new photographic prints. Chrissie and I took the opportunity to stock up on some local produce - Yum!! It will be Aston Marina's turn to have a change over next . . .
Spring Collection Now On Display. I've just launched my new website design. It has lots of new images and a new commissions gallery. The new navigation menu will make it easier to get around. A selection of summer images has now found a home at Aston Marina. I hope you have a chance to go along and see for your self. I have been lucky enough to have had 2 photographs accepted this year. 'Running Up That Hill' and 'Silence' Shire Hall Gallery, Stafford. The 1st picture sold but 'Silence is now on display at Gallery@12 in Eccleshall. Title - 'A Place To Rest' The Roaches. Spring Collection at Aston Marina. A new 'Spring' collection of my work will be on display in April 2014. It's part of an all year round roll-out programme designed to follow the seasons. Feel free to leave any feedback once you've seen the new photographs. 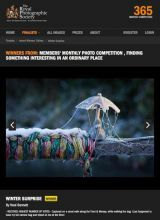 One of my images has been selected for use by the National Trust Magazine. A winter scene called 'Clearing skies' appears to have ticked all the boxes. The photo was taken up in the Roaches, north of Leek. I am currently preparing framed photographs for display on the wall of the Marina Bistro. You will be able to order work from here. Emma & Rupert invited me to exhibit my work in their all new Café. I have been asked to provide additional work to what's already on show. My hand made greeting cards are also on sale in the new gift shop. You can get a great bacon butty there! I was invited to the 'Leek 41' Club (Ex Round Table) by chairman Ian Podmore, as an after dinner speaker - showing my photography. 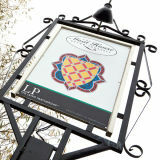 It took place at the Three Horseshoes Inn, just out of Leek, on the way to the Roaches. I was made very welcome by all the members . The food was great too - black pudding, one of my favourites! Ian said "I was the best speaker they'd had all year!" Never thought I'd see the day when I could stand up in front of a room full of strangers and give a good account of myself!! Can't believe it, twice in one year! After weeks of carefully selecting new images, my website now displays more than 570 images across all areas of my work. I hope this makes your visit more rewarding. Stafford Photographic Society also awarded me Best Monochrome Print of the year. I've learnt so much from Stafford PS since I joined in 2005. Best Print of the Year. Farm On The Hill, Prestwood nr. Uttoxeter. I gained my ARPS accreditation at Focus On Imaging at the NEC yesterday. After months of prep' and deliberation I put my reputation on the line. Then she said 'Very Brave' - this put my right at ease!!! Rachel at 3B's start of Lichfield Road, Stone has asked me to exhibit some of my work. It's looking a little bit more like a gallery now! Something for her customers to talk about hopefully! 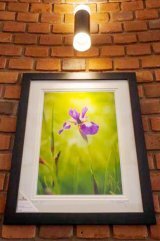 Local photography and watercolours on show . . .
3 Counties Photo Exhibition - Keele Uni. I managed to get 3 framed Limited Edition Prints into Keele again this year. They are for sale, together with many more great pieces of work. Photos in Christmas Staffordshire Life Mag! In an attempt to raise the profile of Stafford Photographic Society a piece has been published showing work from various members of the society. Hopefully this will boost numbers at the door? One of my images of John's Austin 7 called 'No Return within 20 Years' was given a double page spread!! Amazing!! And another image of Mow Cop, Ascent' received a full page spread!! Thank you Staffordshire Life x. 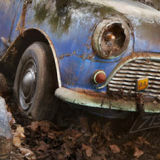 It's been a while, but glad to report my image 'Final Destination' of an Austin 7 in a barn has scooped best print in the Rugley inter-club photographic competition last night. Thanks once again to John and Lyn for letting me borrow their barn and Stafford Photographic Society for choosing it to represent the club. The full image can be viewed in my 'Creative' gallery. Its up stairs on the atrium. Hope you enjoy . . .
and there it was, another Open Studios, done and dusted. Thank you to all who came to see Christina's Pastels and my Photographs. More money raised for Macmillan Cancer Support through raffle, cakes and drinks. Thanks to all who donated their baking skills. The house is almost back to normal now. Workshops to put in the diary. Orders to organise next . . .
Chrissie and I last opened up our home in Stone, Staffordshire, to Open Studios back in 2009 and 2011, which both proved to be successful! We are delighted to be able to invite you to our 2012 event, dates include the middle 2 weekends in September, 15-16 and 22-23. As before, this event will be raising funds for Macmillan Cancer Support. We hope you can come along and join us . . .
Open Studios 2012 is nearly with us again and hear is your invitation to view both Christina's and my work together with other Staffordshire Enjoy Art Members at the BAREWALL Gallery in Burslem on this Friday Evening 18th August. The exhibition runs from 18th August to 1st September. 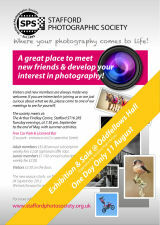 Special One Day Event 11.08.2012 @ Oddfellows Hall, Greengate St. Stafford. An opportunity to see our work and find out about the society and what it could offer you. Members mounted prints will be on sale, helping to raise funds for our club. Hope you can make it . . . I joined the RPS during FOCUS at the NEC earlier this month. I thought it might give me support in my never ending quest for better images. Together with SINWIP and SWPP I should improve gradually? We'll see . . .
as part of an Architectural Exhibition, taking place at the Stafford Shire Hall Gallery. The gallery is closed at the moment, undergoing refurbishment. running right through until the 25th March. I hope you can pop in to see some time . . .
in the main bar of the New Vic. It starts tonight, kicking off is 7pm, but if you can't make it the exhibition is on until the 20th of February. My work will be for sale. The new Gallery, Cafe, Shop also include extensive Craft Workshop facilities! One thing is for sure, you will be made very welcome by this close family run enterprise. Hassle free parking at the rear! New works can now be seen hanging in the fabulous refurbished Moat House conservatory restaurant. Included are more recent local landscapes and nature subjects. I hope you enjoy seeing them, almost as much as the wonderful food and surroundings! for the Stone & District Stroke Club and St Michael's Bells Appeal. It will be on show awaiting bids this Saturday 22nd October at the Trafalgar Dinner, Being held at The Crown Hotel, Stone. If you would like to make a bid please call Miss Jackie Allen on 01785 619743. The retail value of the framed print is £110. Christina and I are taking part in Open Studios 2011. Our Preview evening went very well and I would like to thank all who helped and came along to join our party. The last week end for a visit is 24/25 September! See more on my FaceBook page . 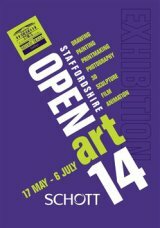 . .
Staffordshire Enjoy Art, Open Studios Preview Exhibition takes place between 13th and 27th August. The exciting new Barewall Gallery will be holding the event, exhibiting some of my work, along side other accomplished artists. Please go along and support Amanda and Paula in their new enterprise at 2-4 Market Place, Burslem. Chrissie and I last opened up our home in Stone, Staffordshire, to Open Studios back in 2009, which proved to be surprisingly successful! We were very busy last September, deciding to skip a year. Now we are delighted to be able to invite you to our 2011 event, dates include the last two weekends in September, 17-18 and 24-25. As before, this event will be supporting the Macmillan Cancer Charity. New showcase for my work. The last two weeks have been very busy for me! All made worthwhile on Friday when I delivered my largest commission of 22 Limited Edition Prints to the Dog & Doublet at Sandon, Staffordshire. It reopened its doors on 1st of April, after an extensive refurbishment. I was fortunate to be asked to provide a selection of images from my collection for all public areas downstairs, 1st floor corridors and bedrooms. 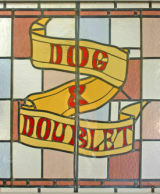 You've just got to go and see the new Dog & Doublet. It's pretty smart now and the food is reported to be very good too! SINWP stands for The Society of International Nature and Wildlife Photographers. This society also supports the field of landscape photography. Got to start work on my award submissions soon. I'll let you know how I get on . . .
SWPP stands for The Society of Wedding & Portrait Photographers. I hope this will help my social photographic skills. Christina and I have joined Staffordshire Enjoy Art for 2011 and 2012. Stay tuned for news regarding Open Studios in September. Trent Mersey Canal last December. For a 2nd year in a row I have a winner at the Three Counties Open Photography Exhibition. Then out with friends from the Stafford Photographic Society afterwards. 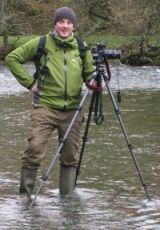 Another rewarding talk @ Walton Photographic Society! This was my second invitation to present a talk at Walton PS. I wanted to show something different this time. Something that would not only hopefully inspire but offer a window into the way I work and prepare my images. So I produced some prints direct from my original RAW files to show a direct comparison, before & after, side by side. It seemed to go down well. Thank you for another enjoyable evening. Hope I managed to answer some of your questions well enough. It was also great to see so many partners being brought along too! Thanks to a company called Blurb I have managed to publish my 1st book! 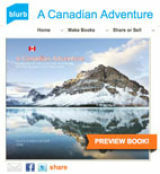 Called 'A Canadian Adventure', it tracks my families story half way across the canadian wilderness. Starting at Calgary, Alberta. On through the rockies, Peachland and onto Vancouver on the west coast of British Columbia. Not only did we get to see all the amazing sights, but also relatives and their friends. 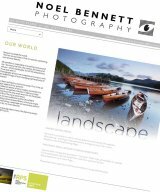 I will be bringing out a more affordable soft back art book showing only the best of my landscape photographs, which will be on sale from the Blurb site and some of my exhibitions. I also hopefully intend bringing out a similar book based on my favorite Lake District spots. Allan + Bertram have used my work in there Premium View wall calendar 2012. I am now next to people like David Noton and Joe Cornish. Hope they don't mind too much!! Move into Stafford's Art2Art Gallery. Sharon and Collin have kindly invited me to exhibit some of my work in Mill Street, Stafford. I first met them when I asked them to produce a canvas print for me via their son up in Manchester. He did a great job and has produced other canvas prints clients have been very pleased with. I hope it will prove be a long term business relationship. 1St Canvas produced by Art2Art in Mill Street Stafford. We visit 'Baxters Retreat', in Keswick each Autumn. This year the owner asked me to take my 1st canvas print of 'Wildlife On Derwent Water' for their cottage. Here it is hanging above our fireplace before taking it up there. You can find the details to 'Baxters Retreat' on my LINKS page . . . I have wanted to display my work closer to the Peak District, from where a draw much of my inspiration. The invitation was taken up with great gusto! I have been allowed framed work and a browser of prints for people to view. Work now being displayed in the Atrium of Gallery oOn The Square in Stone. Good turnout for Gallery @ 12 during the carnival. Mike and Helen, shown here, are members of the gallery and really got into the spirit of the day. Longest day of the year and my sister Patricia's birthday! Stewart George at Radio Stoke gave me the opportunity to give a bit of advice to listeners live on air! Truly a nerve racking experience! If they ask me back I would hope to cut down on the aaaars and hummmms. Still I hoped the tips and encouragement I gave helped people go out and take a fresh look at their surroundings.. Invitation to Gallery@12, First Year Celebration Evening. Gallery At 12 is a small but successful artist's co-oprative based at No.12 High Street in Eccleshall, Staffordshire ST21 6BZ. They are celebrating their first year together and they have asked me, along with two more artists, to join them on the 1st floor of their newly extended gallery. Please come along and see our work on Sunday 16th May between 11am and 4pm, where we will be offering refreshments and an opportunity to meet most of the members, including myself! It's all happening in Eccleshall. Hope to see you there . . .
Michael • • • • • • collected his chosen print 'Tranquility' for winning my draw in this month's Stone & Eccleshall Gazette. Thank you to all of you who took part and for all the favourable feedback I received from my editorial. Lady Mayor of Stoke-on-Trent calls by with Genesis. Outdoor Photography's competition called 'Nature in Winter"! but that didn't stop me trying again. This image has also become a popular image, selling well in the 'Gallery On The Square' in Stone. I just love the effect frost has on the landscape! Centre Spread & A Chance to Win!! 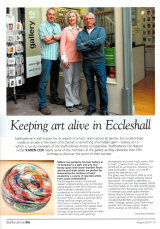 The Stone & Eccleshall Gazette has very kindly used me for a centre page spread this month! Thank you to Christine Conlin for the amusing and complimentary editorial. Hope you enjoy it! To make it a bit more interestiong I have included a draw to win an image of your choice off this website. It will be a signed, limited edition mounted print (16"x12"), worth £40. Details to be posted shortly . . .
Genesis - 3 Counties Photographic Exhibition Winner!! Yes, finally I've cracked it! I have been working hard on my website over the past couple of years and was very surprised to see an article praising my work appear in the latest issue of Outdoor Photography 124. You tend to pitch yourself up against all the other great photographers in these magazines, which makes it all the more rewarding. I find my website so useful when it comes to letting people know a little more about my kind of work. My landscape photography seems to be picking up momentum! I was spotted walking Megan along Trent and Mersey Canal just before Christmas. Helen Boardman and Dave Pickard from the recently formed Walton Photographic Society had recognised me from their regular visits to the Gallery on the Square and Fleur Tea Rooms at the top of Stone High Street. Before I knew it I had agreed to go along and present a snapshot of my kind of photography. I took along prints instead of an AV show. I often find people prefer to see the finished product, looking at it's very best. I let my landscapes take centre stage. Other subjects such as creative and nature were also well received. The evening went by so quickly. I set out not to be too technical giving the odd tip here and there. A coffee break gave me the opportunity to chat to folk. I would just like the thank the club for their warm welcome and a very enjoyable evening! The Society of Professional Image Makers Convention, at Novotel, London West, this month. 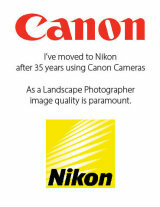 I have used ProAm (photo processing service) along side my own in-house Epson printing for the last 2 years or so. I consider this request a great honour. 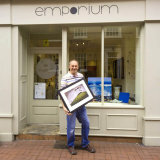 My photographic work is now on display in The Gallery On The Square, Bags of Beautiful Gifts, Granville Square, Stone. You would be most welcome to come along and see my landscape photography. As well as local scenes, you will find other locations shown on this web site. If you can't find what you want call me to discuss . . .
You will also be able to see my wife Christina's pastel paintings at the same venue. Bags Of Beautiful Gifts, Granville Square, Stone Staffordshire. I hope you can come along to view my work soon! Christina and I are very pleased to report our first Staffordshire Open Studios participation has been a great success. We kicked it all off with a very busy preview evening, followed by two well attended weekends. Thank you to all who came along and supported us and helped out with drinks and the washing up etc. We hope visitors who bought our work derive many years of pleasure from their purchase. We will be hosting a similar show in the future and will post details closer to the time. Please come and see both my wife's pastel art and my own Photographic contrabution to our joint exhibition of work, here at our home in Stone, on the last two weekends in September. We, hopefully, look forward to seeing you then . . . I am leased to report a very successful 1st weekend and look forward to 26-27th. Thank you to all who joined us and left such positive feedback! I was very pleased to be accepted into this prestigious national photographic magazine. You can find me in the Portfolio Section of the August issue. I'm so glad that sheep knew what he was doing! I was pleased to receive a selectors award for this submission into the national Cotswold Salon 2009, for monochrome prints. I collect the award tomorrow! After a very close battle I came 1st in the club's Monthly Colour Competitions 2008-2009. It is not an award I expect to pick up again for quite a while! We have quite a phew accomplished members in the SPS which place it as one of the top 10 clubs in the country! Midland Counties Photographic Federation 46th Annual Exhibition. I am pleased to report two awards this year in both Landscape and Nature sections! This date was when this site was first launched. It's purpose is to show some of the photography I have produced over recent years.